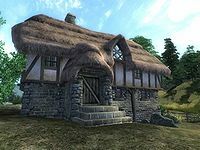 The Brina Cross Inn is an inn on the Gold Road between Anvil and Kvatch (quest-related). It stands slightly east of the junction to Lord Drad's Estate and west of Gottshaw Inn. The publican, Christophe Marane, offers Advanced Blunt training. He will also buy potions and food while only selling the latter. The ground floor contains the reception area consisting of a large, engraved counter and a dining room while the rooms are upstairs. In a small room, on a lower level, you will find Cristophe's bed. The room you can rent is the last on the right: it contains a chest of drawers, a table, a lower-class single bed and a painting. Both of the other rooms are locked and contain a bed, a single and a double, although they are not available to sleep in. The first room's bed is quite interesting. The bed in the first room upstairs has a script (BedDiseaseScript) that would cause the player to have a 20% chance of catching the disease Yellow Tick if the player slept in it. However, it is impossible for the player to sleep in this bed since entering counts as trespassing and the script will not affect NPCs. Therefore the script has no actual effect, unless you use the Console to allow yourself to sleep in the bed. "Brina Cross" can be seen written under the "Sutch" and left of "Kvatch"
The name "Brina Cross" possibly originated from the crossroads that would have existed had Sutch been present in the final release of Oblivion; on the original/alpha map of Cyrodiil "Brina Cross" can be seen on the map next to the crossroads. Esta página foi modificada pela última vez à(s) 06h35min de 15 de fevereiro de 2014.